Amnesia in Bollywood movies | It's a Miracle! Profound amnesia is exceedingly rare in the South Asian sub-continent, but a rather frequent occurrence in Bollywood Hindi films. The most common variety of memory loss involves an on-screen character who has experienced a traumatic life-event usually resulting in head injury. The character then shows no recollection of events occurring prior to the onset of memory loss, a condition known as retrograde amnesia. In Hindi films, the character then leads a new life in an assumed role surrounded by strangers until a second rectifying injury negates the amnesia from the first one. 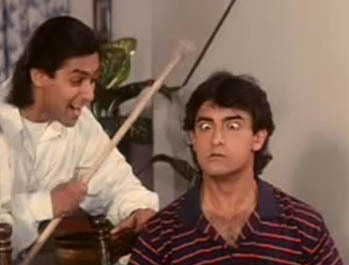 A whimsical take on the filmi cure for amnesia in "Andaz Apna Apna"
One well-known example out of the countless in Hindi films can be found in Henna, in which a character by the name of Chunder falls in a river and loses his memory in India and is rescued in Pakistan where he assumes the name Chand. Chand becomes Chunder again after a violent ruckus, and in the process loses the memories he has formed as Chand. If it sounds confusing and medically implausible, then clearly you are thinking too hard. I’ll give you a minute to clear your mind. Now, If you are still thinking logically, then perhaps you should read this medical review in the British Medical Journal dealing with amnesia at the movies. The review covers some recent examples such as Bourne Identity and 50 First Dates. Although, the focus of the review is on Hollywood movies, Bollywood has generally been very good at following many of the same trends. The most severe causes of real amnesia are psychiatric and neurological disorders often resulting from infection or stroke. Of course, in the movies, it is almost always a result of an injury to the head. The review also mentions the standard personality change and recovery through a second head injury which the author sardonically calls “two is better than one”. The author does point out Memento as a good example of a movie featuring anterograde amnesia. Recently, with Ghajini, a film loosely based on Memento, South Asian films ventured into new territory. In both films, the protagonist suffers a head injury and loses the ability to form memories after the injury. I could not find a specific survey of amnesia in Hindi films, but I did come across medical articles entitled “Mental health in Tamil cinema“, “Malayalam cinema and mental health“, and “Psychoanalysis and the Hindi cinema [sic]” in the International Review of Psychiatry. Not everything that is associated with filmi amnesia is medically inaccurate though. An outstanding paper published in the prestigious scientific journal Proceedings of the National Academy of Sciences on April 12 shows that emotions exist even after memory loss in amnesia patients. Conducted on a series of patients with severe anterograde amnesia (the Ghajini-type of amnesia), the scientists found that the emotions that they could invoke persisted long after the memories had dissipated. That we had to wait until 2010 to get this sort of a landmark study tells you a bit about just how rare this form of amnesia is! Nevertheless, next time you see an amnesiac character in a Hindi film feel anger, love, or sadness even though they have no associative memory, remember that this is this is an aspect of the depiction that is plausible. This entry was posted in Bollywood science by Anirban. Bookmark the permalink. Excellent! I have a friend who has a keen interest in the many, many cases of temporary blindness in Hindi films, so I will send her your way. Thanks for reading. Always glad to be of service! Ah, a tongue-in-cheek treatise on amnesia in Bollywood. About time! Thanks so much. It was on my mind and I was just waiting for a paper in a top-notch journal to come out before writing this one. Now I’m think back to all the mental illness and amnesia films I’ve seen. Then there’s the whole Manichitrathazhu/Aaptamitra/ Chandramukhi/Bhool Bhulaiyaa set of the same film in different languages. And speaking of mental illness, not amnesia, I recently saw a great Marathi film called “Devrai” where Atul Kulkarni plays a character suffering from schizophrenia, it’s a very good film. Sitaji, I read your post; it is quite informative. The author of the book on mental illness in Hindi cinema is a psychiatrist based in the UK who has written a few reviews on the topic. I don’t know if I’d be able to read a whole book on the topic though. It might be too scholarly for general appeal and too flippant for scholarly appeal! There are a lot of films that deal with this topic, but my viewing experience has primarily been in Hindi, English, and Bengali, the three languages I know very well. In Bengali, the most-loved depiction of amnesia is the 1957 National Award-winner from Ajoy Kar starring Uttam Kumar and Suchitra Sen, Harano Sur. PS- Will think about the temporary blindness asa topic for future content too! I think Uttam-Suchitra had an onscreen chemistry that was unmatched in Bangla movies at the time. Thanks for reading. You have a very nice blog! Hahaha… well put. I have the same problem with movies. I see so many of them (will purchase my 300th Bengali movie this month) I get them mixed up too. Thanks for reading! Happy Naba borsho to you as well! Yeah, the cure is to hit him in the same place. Hmmm… Sitaji pointed out a case (Sadma) where it happened to a female star (Sridevi), but it does happen more often to males, doesn’t it? If the real person playing the lead male actor in the movie demands that the movie should have intimate ‘scenes’ (“how many scenes are in the movie?”) involving him and three actresses (not a foursome, tho’), the director will have little choice but to whack the hero on the head a few times. The hero in the movie can not be amoral, but the actor wants to get close to three women – amnesia is the only solution. That is a very analytical observation. I hadn’t thought of it that way, but your comment makes perfect sense. If I write a longer piece for an actual review or a book, I’ll be sure to point this out and acknowledge your contribution. Nice one…at first I thought this was just a sarcastic attack on celluloid depiction of amnesia (which would have been just fine! ), but this post evolves into provoking some serious thought. The research you’ve done is commendable. I am gonna read those articles someday! Thanks. I know what you mean. I change the tone so often in my posts, that it runs the risk of confusing others. I don’t think it is a problem if my serious posts are taken as a joke. I worry about the other way around! “Andaz Apna Apna” was a much needed satirical take on Hindi filmi cliches. I thought it was great when I first saw it many years ago. Best wishes! Nothing like a bit of satire to start your day off.It’s just wonderful how you come with supporting evidence for all your posts. I discovered your blog via a friend (and I am so grateful to him). I read this while I am eating a drab lunch and having a dull day and what I really needed was a good laugh! This post provided exactly that! I am LMAO at work while colleagues are wondering what the hell happened. Thank you. I totally enjoyed this and the post about MPK! !